Charli is at riding camp, where her dream is about to come true - she will finally learn to ride a real, live horse. But when show-off Mikaela picks the horse Charli wants, her heart bungees to her toes. Instead of the beautiful palomino Razz, Charli’s stuck riding the massive retired racehorse Spud. And what about the bats that fill the night sky? Don’t bats spread deadly diseases? Riding camp isn’t turning out the way Charli planned, especially when she finds herself in the middle of a life-threatening disaster. Charli dreams of owning a horse; if she could only learn to ride and win the gymkhana she might convince her parents to buy her one. It’s a big challenge but Charli has determination in spades – especially when it comes to horses. So when she finally makes it to her first riding camp, her excitement breaks from a trot to a gallop. But an untamed imagination can be a dangerous beast, especially when it starts jumping to conclusions. Through a series of misadventures Charli finally learns to harness her mind to discover a larger world. 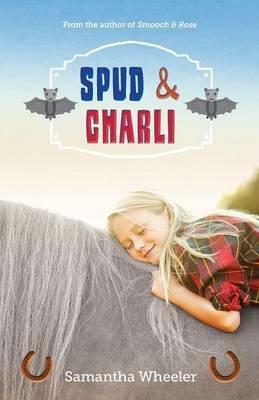 A delightful canter through a world of horses, riding and gymkhana, Spud & Charli offers some important lessons about life, community and nature. The author of the charming Smooch & Rose (shortlisted for the 2014 Readings Children’s Book Prize) has given us a story any animal enthusiast is sure to love. Highly recommended for ages 7 and up.